620 pages | 102 B/W Illus. Jack Wong is regulatory affairs head, Asia Pacific, at Baxter Healthcare. He has more than 20 years of experience in regulatory affairs, clinical trials, and pharmacovigilance in Asia with good knowledge in the field of medical devices, pharmaceuticals, and nutritional, consumer healthcare, and biological products. 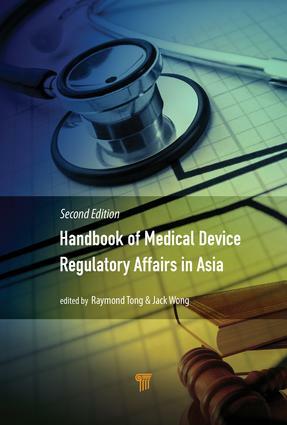 Raymond Tong is professor and founding chair in the Department of Biomedical Engineering, the Chinese University of Hong Kong; chair, the Hong Kong Local Responsible Person Panel; chair of the Asia Regulatory Professional Association (ARPA)-Hong Kong Academy; and honorary advisor of the Hong Kong Medical and Healthcare Device Industries Association.